With the start of the Barça US Tour 2017 fast approaching, the corner of Allen and Delancey Streets in Manhattan’s Lower East Side has a new mural depicting FC Barcelona’s attacking Trident. Leo Messi, Neymar Jr and Luis Suárez have been painted under the title Ready for U.S. The mural is the work of Leif Mcllwayne, @beast_streetart on Instagram, and has appeared thanks to the New Allen Foundation for Urban Art, which has brought together a collective of graffiti artists with the aim of turning Allen Street into the first open air art gallery in the city. 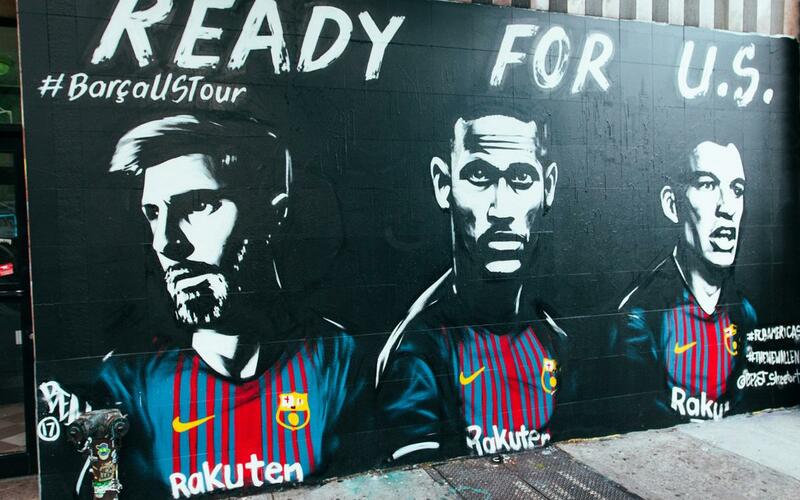 The mural references FC Barcelona’s upcoming visist to the United States for their preseason tour between 19 and 30 July. Ernesto Valverde’s side will face Juventus, Manchester United and Real Madrid in the North American International Champions Cup (ICC), a competition being organised by Relevent Sports for the fifth time. The blaugrana will make their debut in the competition against Juventus at the Metlife Stadium in New York on 22 July (6.00pm local time, 12.00am CET on 23 July). The second match will be played against Manchester United at the FedEx Field in Washington on 26 July (7.35pm local time, 1.35am CET on 27 July), and they will finish off with a match against Real Madrid at the Hard Rock Stadium in Miami on 29 July (7.30pm local time, 1.30am CET on 30 July). This will be the seventh time FC Barcelona have enjoyed a preseason in the United States. In 2003, Frank Rijkaard’s team played three matches in North America against Juventus, AC Milan and Manchester United. Three years later, they played against Chivas Guadalajara, Club América and the New York Red Bulls. In Pep Guardiola’s first season in charge in 2008, FC Barcelona played two games in the USA against Chivas Guadalajara and the New York Red Bulls. A year later, the opposition was LA Galaxy, the Seattle Sounders and Chivas Guadalajara. Manchester United, Chivas Guadalajara and Club América were the rivals in 2011. Finally, in 2015 the blaugranes went on their latest preaseason tour to the USA to take on LA Galaxy, Manchester United and Chelsea. The fact FC Barcelona are travelling to the United States, a strategic priority for the Club, is part of its strategic plan and global growth. In September, FC Barcelona opened an office in New York with a delegation led by President Josep Maria Bartomeu with ex-Barça player Ronaldinho taking the inaugural shot to open the offices in the Big Apple. Barça also has an office in Hong Kong as part of its quest for global expansion.